(1) Iga, Y. and Yoshida, Y., “Mechanism of Propagation Direction of Rotating Cavitations in a Cascade”, Journal of Propulsion and Power, Vol. 27, No. 3 (2011), pp. 675-683. (2) Iga, Y., Hashizume, K., and Yoshida, Y., “Numerical Analysis of Three Types of Cavitation Surge in Cascade”, Transactions of the ASME, Journal of Fluids Engineering, Vol. 133, Issue 7 (2011), pp. 071102-1 - 071102-13. (3) Iga, Y., Hiranuma, M., Yoshida, Y., and Ikohagi, T., “Numerical Analysis of Cavitation Instabilities and the Suppression in Cascade”, Journal of Environment and Engineering, Vol.3, No.2 (2008), pp.240-249. (4) Iga, Y. and Konno, T., “Numerical Analysis of Influence of Acceleration on Cavitation Instabilities in Cascade”, Proceedings of AICFM-11, Chennai India, (2011). (5) Iga, Y., Ochiai, N., Yoshida, Y., and Ikohagi, T., “Numerical Investigation of Thermodynamic Effect on Unsteady Cavitation in Cascade”, Proceedings of CAV2009, Michigan USA (2009), Paper No. 78. (6) Terada, T. and Tokuyama, M., “Universalities in the Dynamics of Suspensions of Magnetic Colloidal Chains Confined in Thin Films”, Journal of the Physical Society of Japan, Vol. 78 (2009), pp. 084803-1-6. 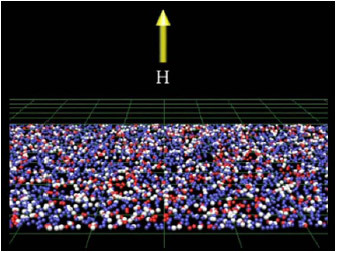 (7) Terada, Y. and Tokuyama, M., “Lateral Diffusion of Magnetic Colloidal Chains Confined in Thin Films and Monolayer Colloids”, Journal of the Physical Society of Japan, Vol. 79 (2010), pp. 034802-1-6. (8) Terada, Y. and Tokuyama, M., “Spatial Dimensionality Dependence of Long-Time Diffusion on Two- and Three-Dimensional Systems near Glass Transition”, Intermetallics, Vol. 18 (2010), pp. 1834-1836. (9) Tokuyama, M. and Terada, Y., “Slow Dynamics and Re-Entrant Melting in a Polydisperse Hard-Sphere Fluid”, Journal of Physical Chemistry B, Vol. 109 (2005), pp. 21357-21363. (10) Tokuyama, M. and Terada, Y., “How Different Is a Hard-Sphere Fluid from Suspension of Hard-Sphere Colloids near the Glass Transition?”, Physica A, Vol. 375 (2007), pp. 18-36. (11) Inoue, O., Iwakami, W., and Hatakeyama, N., “Aeolian Tones Radiated from Flow Past Two Square Cylinders in Side-by-Side Arrangement”, Physics of Fluids, Vol. 18, Issue 4 (2006), 046104. (12) Iwakami, W., Kotake, K., Ohnishi, N., Yamada, S., and Sawada, K., “Three-Dimensional Simulations of Standing Accretion Shock Instability”, The Astrophysical Journal, Vol. 678 , No. 2 (2008), pp.1207-1222. (13) Iwakami, W., Kotake, K., Ohnishi, N., Yamada, S., and Sawada, K., “Effects of Rotation on Standing Accretion Shock Instability in Nonlinear Phase for Core-Collapse Supernovae”, The Astrophysical Journal, Vol. 700, No. 1 (2009), pp. 232-242. 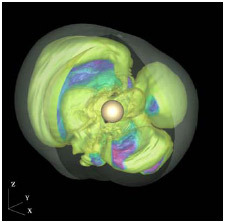 (14) Iwakami, W., Ohnishi, N., Kotake, K., Yamada, S., and Sawada, K., “Spiral Mode of Standing Accretion Shock Instability in Core-Collapse Supernovae”, Astrophysics and Space Science, Vol. 322, No. 1-4 (2009), pp. 43-47. (15) Nakano, I. W., Hatakeyama, N., and Hattori, Y., “A Study of Volume Penalization Method Applied to High-Order Accurate Schemes”, Seventh International Conference on Flow Dynamics Proceedings (2010), pp.138-139. (16) 竹島由里子, 藤代一成, “GADGET/FV：流れ場の可視化アプリケーション設計支援システム”, 画像電子学会誌, Vol. 36, No. 5 (2007), pp. 796-806. (17) 竹島由里子, 高橋成雄, 藤代一成, “位相属性を用いた多次元伝達関数設計”, 情報処理学会論文誌, Vol. 46, No. 10 (2005), pp. 2566-2575. (18) 竹島由里子, 高橋成雄, 藤代一成, “位相的ボリューム骨格化アルゴリズムの改良”, 情報処理学会論文誌, Vol. 47, No. 1 (2006), pp. 250-261. (19) 竹島由里子, 藤代一成, 高橋成雄, 早瀬敏幸, “微分位相強調型ボリュームレンダリングのための照明配置設計”, 画像電子学会誌, Vol. 38, No. 7 (2009), pp. 459-470. (20) 小田川雅人, 竹島由里子, 藤代一成, 菊川豪太, 小原拓, “GPUを用いた適応的粒子系可視化”, 日本機械学会論文集 (2011), 掲載予定.